MESSENGER's Earth flyby on Aug. 2, 2005, not only adjusted the spacecraft's path to Mercury - the gravity assist maneuver allowed the spacecraft team to test several MESSENGER science instruments by observing its home planet. The Mercury Dual Imaging System's wide-angle camera passed with flying colors—several of them, actually—snapping a number of images across its full multispectral capability. The camera is designed to characterize minerals that may have formed in Mercury's crust. Telescope measurements from Earth suggest that Mercury's surface resembles the highlands on our moon: abundant feldspar (anorthite) with limited amounts of iron-rich minerals such as pyroxene and olivine. The MESSENGER team carefully picked 11 filters across visible and near-infrared wavelengths (400 to 1,100 nanometers) known to indicate these and other common silicate minerals. 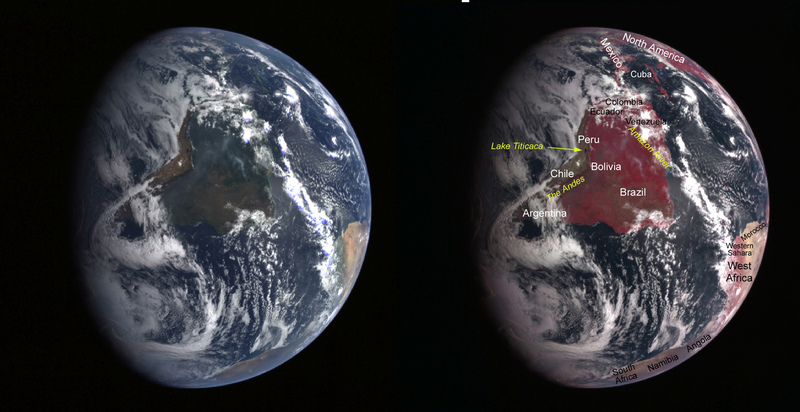 This side-by-side look at Earth illustrates the value of multiple-wavelength imaging. The three-band composite at left is made from filters with peak sensitivities near 480 nm, 560 nm and 630 nm. These filters help distinguish materials with distinct visible color differences (ilmenite, volcanic glasses) but are also very close to the sensitivity of the human eye. (Natural color is somewhat subjective, so this combination of bands is "approximate" natural color.) The spacecraft was 63,950 miles (102,918 kilometers) above Earth when the images were taken. The camera's computer can mix red, green, and blue (RGB) light in various proportions to create a full spectrum of colors. Infrared images are visualized by substituting one of the RGB components. On the right, the red component is the 750 nm band and green and blue are formed from the 630 nm and the 560 nm bands. Despite the substitution of only one band, the results are dramatically different. Continental areas are mostly red due to the high reflectance of vegetation in the near-infrared. Short wavelength light (blue) is easily scattered in the Earth's atmosphere, producing our blue skies, but also obscuring the surface from MESSENGER's viewpoint. 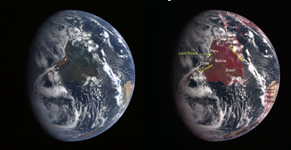 Infrared light is not easily scattered, so images of the Earth remain sharp. The red coloring in the center of the image is a reflection of the Brazilian rain forests and other vegetation in South America. Once in orbit around Mercury, MESSENGER will map the entire surface in all eleven wavelengths—and at resolutions ten times better than seen in this view of Earth.